THE PGF SE CHAMPIONSHIPS ARE RETURNING IN 2019! The Greater Nashville area will once again host this event from July 16-20 in 2019. Over 200 teams in 10u, 12u, 14u, 16u and 18u divisions have attended the event in last two years from over 20 states and Canada. Qualifiers have already begun. Make sure to make your plans now to attend this great event. For more information, please call 615-948-2888 or email TNPGFsoftball@gmail.com. ALREADY OVER 190 TEAMS FROM 15 STATES! GET YOUR SPOT TODAY AS WELL!! You may also contact Traveling Teams directly toll-free at (866) 468-3268. COLLEGE COACHES- Please let us know that you'll plan to be here this year! Just email us at TNPGFsoftball@gmail.com and let us know. We'll have an event pass and a packet waiting for you upon arrival. Be sure to check out the numerous discounts available with your event wristband- scroll down for more details! THE POOL GAME SCHEDULES, POOLS & RULES HAVE BEEN EMAILED TO ALL COACHES ON THE EVENING OF WEDNESDAY, JULY 11TH. FOR ALL LIVE UPDATES THROUGHOUT THE EVENT. TWITTER WILL BE OUR PRIMARY ON-SITE METHOD FOR ANY WEATHER UPDATES THAT ARE NECESSARY. MORE INFO BELOW AS WELL- BE SURE TO SCROLL ALL THE WAY DOWN! Please note that if weather affects some portion of the event, we may conclude the event on Sunday, July 22. Teams may check in as they like throughout the afternoon, but PLEASE make sure you have someone check your team in or your team will not be allowed to participate. Team Check In will remain open until the conclusion of Opening Ceremonies on the evening of Monday, July 16th. We'll also have a complimentary Photo Booth for all to enjoy throughout Opening Ceremonies as well!!! Get your own personalized TRADING CARDS for trading at the 2018 PGF Championships! PGF and Dinger Select Trading Cards will be kicking up the fun! Grab your 2018 Dinger Cards to trade with other players during the 2018 PGF Championships in Nashville. The cards look and feel like a "big league" card with stats, team name etc. and are designed to the color of your team logo. Don't sit on the bench- get yours today. Click on the link below to order yours today! Special times will be set aside for trading during opening ceremonies, don't miss out. Click on the link at the link below to start the process. Fill out all the info for the front and back of the card, select the style and the amount, checkout and we will do the rest. Cards will be shipped in time for tournament trading. It's an experience that you will not soon forget. Parents don't let you players sit on the sideline. Trading your own personalized cards will be thing to do in 2018. Each and every year thereafter, collect cards from players across the country. Make memories that will last a lifetime. Personalized stats and player information enhances the experience and creates a bond with opposing players that will last. Gift bag exchange—this is a tradition at Nationals and we certainly plan to honor it for those that want to participate. It especially is enjoyable for the younger teams. As such, we’ll suggest that all teams in the 10u and 12u divisions may feel free to exchange gift bags with their first pool game opponent prior to the game. In the 14u, 16u and 18u divisions, we’ll leave this process as an option only for the teams that choose to participate. Once the pool game schedule comes out, if your team (in 14u, 16u or 18u) desires to exchange gift bags with your first pool game opponent, we recommend that you shoot them a quick email and verify that they would like to do the same. If they do not, please let us know and we’ll keep a running list of teams that do not have a gift bag exchange partner and we’ll pair you up with a team that wants to participate. Pin Trading— This is another Nationals’ tradition and we certainly encourage anyone that would like to participate to feel free to do so at both Opening Ceremonies and throughout the week. PLEASE ALSO NOTE THAT SEVERAL DISCOUNTS HAVE BEEN ARRANGED FROM AREA BUSINESSES AS WELL AND ALL REQUIRE THAT YOU ARE WEARING A WRISTBAND FROM THIS EVENT IN ORDER TO RECEIVE THE DISCOUNTS. YOUR COACHES INFO PACKET WILL HAVE MORE DETAILS ON THE DISOCUNTS AND ESTABLISHMENTS THAT ARE OFFERING THEM. 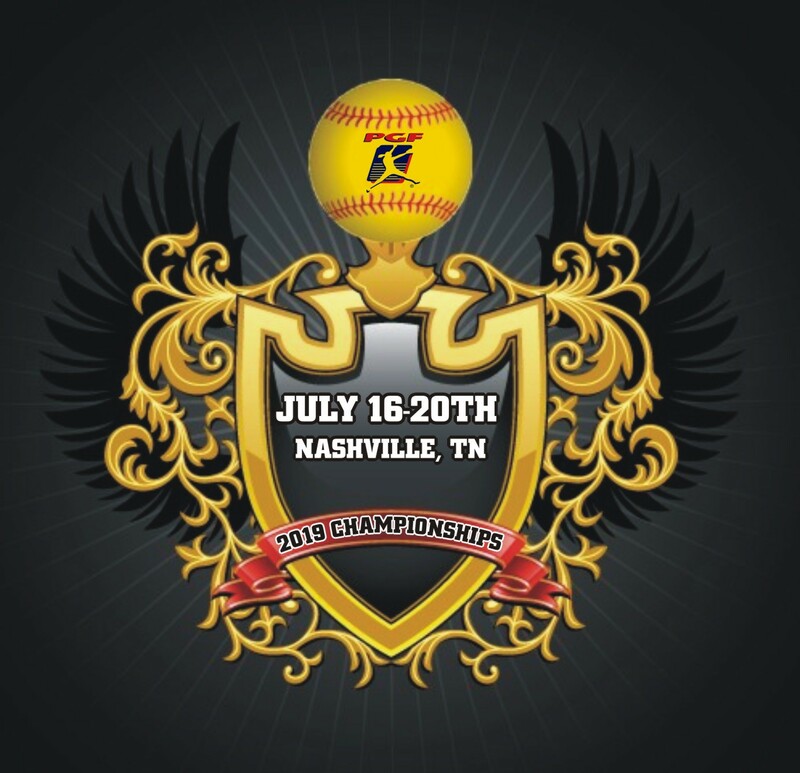 Online score tracking and more—Tennessee PGF will be updating scores online throughout the event at our website (www.tennesseefastpitch.com) in the Championships section. We will also have specific updates available via Twitter (@TennesseePGF). Because of its immediate nature, Twitter will be our primary method of information dissemination for all weather-related matters. Please make sure that you and/or players on your team are following us on Twitter before the event begins to assure that you stay fully updated. We will also try to pass along updates via the website, but Twitter is much faster. So be sure to set this up prior to the event beginning. Copyright © 2014 Tennessee Fastpitch. All Rights Reserved.